Training Industry continuously monitors the training marketplace looking for the best providers of gamification services/technologies in support of corporate learning and development. This fourth annual list is designed to help buy-side organizations in their searches for the right gamification training partners. TIS (MPS Interactive Systems) is a global leader in interactive learning solutions. TIS has featured among the Top 20 Gamification Companies for the past three years. TIS has an enviable track record of designing solutions for its global clients, including Fortune 500 companies. The company has won 100+ prestigious learning awards & recognitions. We are a team of professionals totally dedicated to great learning and improved business outcomes, achieved through games and experiential learning. With 30 years’ experience and a highly skilled team, we provide unrivalled results for our clients. Our focus is on improving your Profit Ability, through our collaboration with you. AllenComm is a leader in innovative gamified custom training solutions that consistently elevate employee and business performance. With some of the largest L&D, creative and technology teams in the country, we create multi-award-winning learning solutions that precisely meet the needs of our clients and are uniquely tailored and performance focused. Axonify is pushing beyond the boundaries of e-learning with the introduction of the world’s first employee knowledge platform. Built with the fundamentals of brain science, adaptive microlearning, gamification, game-mechanics and knowledge-on-demand at its core, the Axonify Platform is proven to drive business outcomes. GP Strategies incorporates gaming elements into performance and instructional solutions to align with learner expectations, assess knowledge and foster learner engagement in an ever-increasing need to provide greater context and depth to learning. With a team of professionally trained and highly experienced Triple A gaming professionals, NIIT has designed and developed a wide range of game-based training, virtual reality, augmented reality and simulation experiences across content domains and delivery modalities. mLevel is a learning technology that dramatically improves the effectiveness, engagement and retention of learning. It allows organizations to easily implement some of the most innovative learning strategies in use today such as microlearning, mobile, gamification and game-based learning with no code on any device while measuring results. Gamelearn is the world leader in the development of game-based learning solutions for corporate training. Thanks to its serious games, Gamelearn covers the most in-demand soft skills in the coming years through serious games. Its methodology has trained more than 200,000 employees from over 1,000 companies around the world. Growth Engineering is a multi-award-winning learning technologies company. They focus on engaging learners with their training and are specialists in applying gamification to online learning programs. Among their solutions are the Academy LMS, the world's #1 NextGen LMS, and Genie, a game-based content authoring tool. At the Virtual Heroes Division of ARA, we create innovative training and simulation solutions to improve your safety, security and way of life. Our immersive, 3D interactive serious games and virtual worlds enhance education, training, and mission planning and rehearsal. Cognizant’s Digital Learning group is a part of Cognizant’s Digital Business (CDB), one of the largest digital solution companies. Digital Learning group has over 1200+ learning solution experts and consultants who work towards creating custom learning solutions for over 300 clients YoY with scale and creativity. Alchemy Systems is the global leader in helping companies build the knowledge and confidence of their frontline workforces to drive safety and productivity. Our training can be adapted to any topic across the hospitality and retail industries. By the end of 2017, our product will be in 17 languages and 87 countries, to be accessed by 450,000 users. Raytheon Professional Services (RPS) is a global leader in training services that help world-class organizations drive workforce performance across the enterprise. RPS analyzes, designs, implements, and manages customized and scalable training solutions to increase efficiency and effectiveness. Designing Digitally, Inc. is an industry leader in the fields of gamification of learning, serious games, training simulations and mobile learning. They are dedicated to providing high-quality interactive learning solutions to instigate positive changes in behaviors within an organization. Paradigm Learning empowers organizational leaders to develop business-savvy and aligned employees, leaders and sales professionals with innovative, fun and creative learning experiences. SweetRush has captured a singular space in the industry with a uniquely effective formula for improving employee performance. Clients seem to love and trust SweetRush and their culture of caring and commitment, backed by an award-winning portfolio. With blended learning, ILT/VILT, gaming, mobile and VR, they deliver the best learning solutions. PDG is a learning consultancy that is committed to innovation and engagement. PDG has used gaming as a primary learning method since our founding in 2002. Engagement is key to retention, and practice is critical to application—and gaming is one of the best tools to provide both. Allen Interactions strives to help organizations navigate learning game design. By moving from content-driven to performance-based learning and including elements from a series of disciplines, we marry gamification training with mechanics to instructional design. G-Cube is an end-to-end e-learning solutions provider. It has worked with varied array of clients from different industries. As a result, it has developed substantial expertise in the conceptualization of learning units and developing content, as well as providing support for learning strategies like game-based learning and gamification. As part of our commitment to continuously monitor the training marketplace for the best providers and services we announce the fourth annual Gamification Companies Watch List. 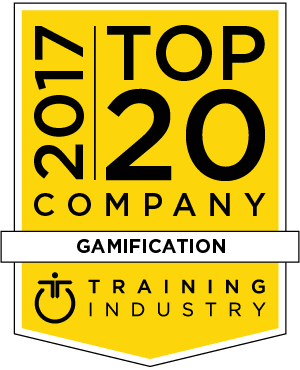 The 2017 Gamification Companies Watch List is intended to help buyers of training services evaluate gamification providers, representing emerging or unique strengths or capabilities. MOS LMS-LCMS enables the creation of appealing learning portals for a full immersion in a challenge, enigma or mission. We provide credits, points, virtual currency, gauges, badges, rankings, levels and dashboards. Leaderboards are not only targeting single users but also groups, regions, and countries for a more challenging experience with no names! Since 2010, Scrimmage has been innovating mobile learning with its gamification solution leading the way. With its vast range of features for any device, our award-winning gamification tool has enjoyed success for learners across industries and across the globe. KNOLSKAPE creates experiential solutions that transform organizations into a modern workforce. Our core belief is that desired business outcomes are achieved best with an engaged workforce. Keeping with this philosophy, we develop engaging, immersive and experiential solutions for talent assessment, development and engagement. Filament Games is a world-class developer of learning games and simulations that improve people's lives. Through partnerships with over 45 organizations, Filament Games has developed more than 100 games over the past 12 years. The 30-person studio prototypes, designs and develops projects across every subject area, age group and digital medium. Since its establishment in 2012, GamEffective has changed the way companies motivate, train and coach their employees. Its gamified learning platform seamlessly integrates with existing systems, using real-time data to engage employees, drive proficiency and significantly improve performance in sales teams, call centers, learning, onboarding, and more. We at Arcusys believe that combining our versatile expertise with leading technologies helps us provide our customers outstanding solutions. Valamis - Learning Experience Platform helps our customers to create engaging learning experiences, manage competencies, meet regulatory compliance, and far beyond. Gyrus Systems is the premier sixth generation learning sanagement system (LMS) provider in North America. We work with training and development leaders, safety and compliance managers, and HR professionals to deliver true, integrated, end-to-end employee development solutions for the last 30 years in 17 different countries. Since 1988, Digitec Interactive has used technology and innovative design to create transformative learning experiences that include e-learning, gamification and simulation. Digitec is nationally recognized for custom e-learning services, as well as their signature learning management system, Knowledge Direct. OnPoint delivers powerful yet affordable online and mobile solutions for the enterprise. Our CellCast Solution enables teams to create and deliver content to on-the-go workers using device-specific apps that manage the user experience and ensure “anytime” learning mixing social, games and media in a responsive, fully customizable UX layer. BTS is the world leader in leveraging business simulations and experiential learning to align people to strategy and develop the capabilities they need to succeed. With 30+ years of experience in creating custom simulations and gamified learning experiences, BTS offers a range of solutions that span the business and employee lifecycle. For 38+ years, CLD has created customized training solutions. With the right combination of learning, creativity, and technology, we develop innovative gamification that complements accurate and engaging content. Our long-standing relationships with our customers are a testament to CLD’s ability to deliver training of the highest quality. The Game Agency creates training games for K-12 and Fortune 500 clients to complement their educational initiatives, increase employee engagement, and improve retention while providing tons of actionable data to measure the effectiveness of their campaigns.